2013 was my year to FINISH. Thanks to One Little Word from Ali Edwards, I carried finish with its many meanings with me throughout the year, and it was fantastic. I found that having the word really helped me to get in the right mindset to follow through, and the intentions + actions I set (and reset) helped me to think ahead better to accomplish long term goals. October FINISH fini | I will read a book in French. I’m still working on reading Harry Potter A L’Ecole des Sorciers , and it doesn’t bother me one bit that I’m not finished yet. It’s slow going for me, and I have to have complete focus (read: alone time) to read it successfully. So it will be a long time yet, but I’ll finish it eventually! I also worked hard on finishing our halloween costumes on time. November FINISH draft | Write a new draft of my novel. I decided to ditch this plan and instead worked on writing class content for upcoming workshops. I also submitted a few scrapbook layouts to magazines, which will be published in the Spring! It’s ironic that one of my main reasons for choosing the word “finish” was so that I’d have motivation to finish the novel I’ve been working on for years, but I really found that I was finished with it in another way– I don’t like it and I’m not sure if I’m going to forget the manuscript entirely or throw the characters into another setting. I found that it wasn’t working and I didn’t love it, and focused on other passions that made me happier instead. Instead of interpreting that as failure, I feel lighter and refreshed. December FINISH debt | We will decimate our debt! I give myself a C+ on this one, but it is better than nothin’. Here’s to finishing it off in 2014. This month I finished our Christmas gifts on time (even though I was finishing up Christmas Eve), which is nothing short of a miracle. FINISH was good to me, and I know I’ll carry the mindset with me next year, though my 2014 word SAVOR is nearly the opposite of finish! But more on that tomorrow. Did you have a One Little Word in 2013? How did your word work out for you? P.S. If you need help setting your goals, I recommend I Choose, a self-paced class from Elise Blaha Cripe, is an amazing companion to Ali Edward’s One Little Word. P. P. S. Make sure to head to the New Year’s blog party at Lemon & Raspberry January 1st! There will be a lot of great resources for goal setting, including my top 5 tips for making sure you finish! I have loved following along with you, Kam, Amy, Elise and others and your words. I chose CHANGE in 2013 and although I had a lot of changes in 2013 I don’t really feel I fully embraced my word to help me live a fuller life. I’ve chosen BUILD for 2014 and I’m hoping to use more in my daily life. 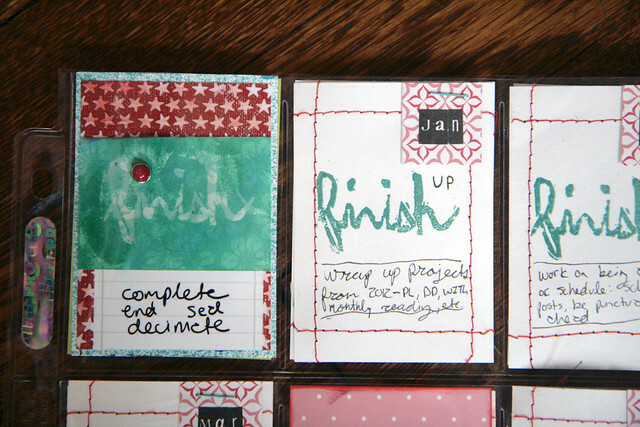 I’m going to set some monthly goals using Elise’s workshop and hope to blog more about my word.